I love these rolls, I got this recipe from my friend Christina – Thanks! They are very easy to make and freeze well. That is plus a for me! I have included some pictures to help you out in what it should look like along the way. I am going to just put the recipe in a format you can easily print, then label the pictures below. Also, be sure you start about 2 hours before you are going to eat, it takes about 1 hour and 40 minutes for total rising time. So, what wonderful roll or bread recipes do you have? 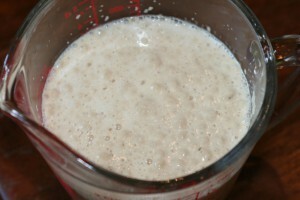 In a large bowl, stir together warm water, yeast and sugar. Let stand until creamy, about 10 minutes. Tip: This is called “proofing” your yeast. To the yeast mixture, add the oil, salt and 2 cups flour. Stir in the remaining flour, ½ cup at a time, until the dough has pulled away from the sides of the bowl. Turn out onto a lightly floured surface, and knead until smooth and elastic, about 8 minutes. Lightly oil a large bowl, place the dough in the bowl, and turn to coat. Cover with a damp cloth, and let rise in a warm place until doubled in volume, about 1 hour. Tip: I mix everything into a large glass bowl and I knead it right in the bowl. Deflate the dough, and turn out onto a lightly floured surface. 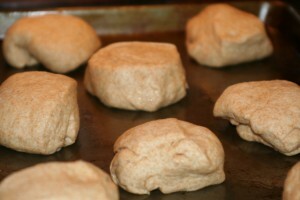 divide the dough into 16 equal pieces, and form into round balls. Place on lightly greased baking sheets at least 2 inches apart. 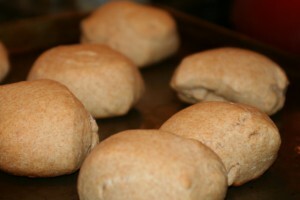 Cover the rolls with a damp cloth, and let rise until doubled in volume, about 40 minutes. Meanwhile, preheat oven to 400 degrees. Bake for 15-18 minutes in the preheated oven, or until golden brown. mmmm… I don’t think I gave this one to you so I can’t take credit- maybe it’s from your friend Chris? I think I’m going to have to try these! Do you freeze the dough or the rolls after they are cooked? Thanks so much! I froze mine after they were cooked (a little undercooked, so not to overcook the next time around). But, I know you can freeze before you let them rise (as rolls), then unthaw and rise to cook. Does that help? have such a wonderful crunch…..of course they are always better fresh out of the oven, but they do store beautifully. Going to try using whole Wheat hoping it turns out as well. Wondering what to do about making a lighter weight roll? Does anyone have any ideas? Appreciate your ideas. Thank you.